If you’ve ever appreciated the artwork showcased all around West Street Market – on our main gallery wall, in Thali and Estoric, and in the back space – and idly wondered about the artists behind any of it, you’re in for a treat. We’re hosting an artists’ reception Sunday, February 3, with a bonus songwriter’s open mic night from the Reno Music Project. Yep, it’s a twofer! It’s shaping up to be a busy evening. The Reno Music Project is hosting one of its fan-favorite open mic nights, and we’ll also be celebrating our current crop of amazing artists. That’s the thing about the biggest little city – this is a creative hotspot filled to the brim with budding talent, and we think that’s totally worth celebrating. 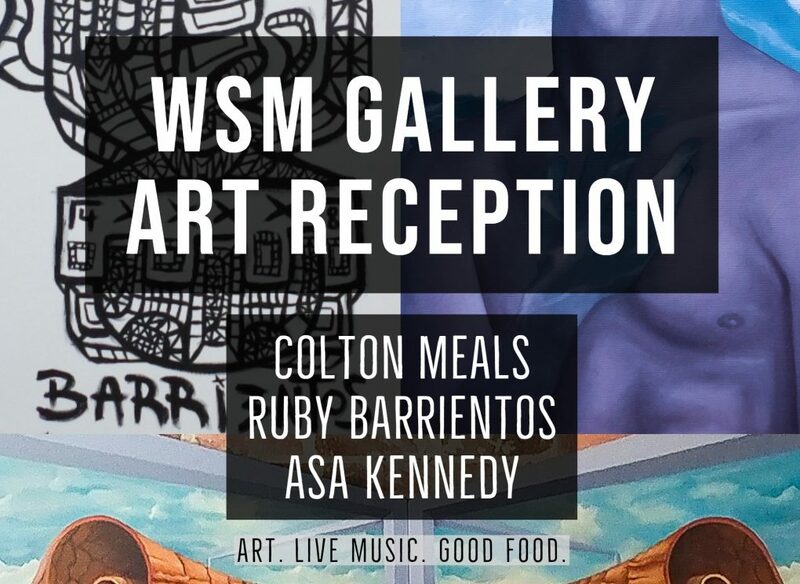 Ruby Barrientos, Asa Kennedy, and Colton Meals, who is our latest featured artist, will be on hand during the artists’ reception, and between the amazing food and the live music, an event it will be. We’re reaching out to past artists we’ve been fortunate to showcase, as well as a few new artists we’re excited to feature down the road. In other words – it’s an event oozing with artistic talent and vision and creativity, and if you’ve ever wanted the chance to meet the genius behind the work you’ve admired on our walls, this is it. The Reno Music Project will be featuring its own brand of musical artistry in the back room, so we’ll be celebrating self-expression in all its forms. Remember, these are family-friendly events featuring original music talent, so don’t miss out. February will also see a new artist in Thali, and Ruby’s work will be featured in a six-month residency in Esoteric, with new work going up every month. We’ll also be showcasing a group effort on the main gallery wall, so stay tuned for details there. In the meantime, mark your calendar now for the West Street Market Gallery Art Reception from 6-8 pm and the songwriter’s open mic hosted by Reno Music Project starting at 5 pm, both on Sunday, February 3. We’re keeping this post short and sweet, so remember – artists and their art, great food, and live music, all going down at West Street Market on February 3. See you there!